Performance benchmarks are an insightful way to compare new products on the market. 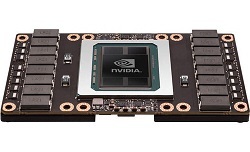 With so many GPUs available, it can be difficult to assess which are suitable to your needs. Various benchmarks provide information to compare performance on individual algorithms or operations. Since there are so many different algorithms to choose from, there is no shortage of benchmarking suites available. 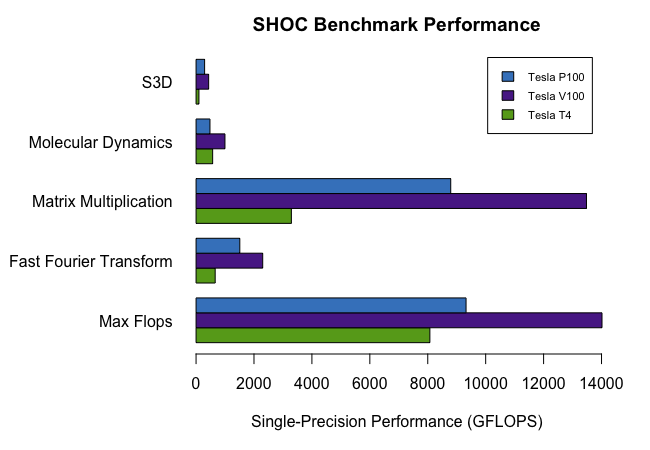 For this comparison, the SHOC benchmark suite (https://github.com/vetter/shoc/) is used to compare the performance of the NVIDIA Tesla T4 with other GPUs commonly used for scientific computing: the NVIDIA Tesla P100 and Tesla V100. The SHOC benchmark suite includes options for many benchmarks relevant to a variety of scientific computations. Most of the benchmarks are provided in both single- and double-precision and with and without PCIE transfer consideration. This means that for each test there are up to four results for each benchmark. These benchmarks are organized into three levels and can be run individually or all together. 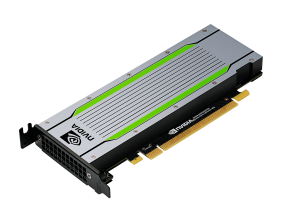 The Tesla P100 and V100 GPUs are well-established accelerators for HPC and AI workloads. They typically offer the highest performance, consume the most power (250~300W), and have the highest price tag (~$10k). The Tesla T4 is a new product based on the latest “Turing” architecture, delivering increased efficiency along with new features. However, it is not a replacement for the bigger/more power-hungry GPUs. Instead, it offers good performance while consuming far less power (70W) at a lower price (~$2.5k). You’ll want to use the right tool for the job, which will depend upon your workload(s). A summary of each Tesla GPU is shown below. In our testing, both single- and double-precision SHOC benchmarks were run, which allows us to make a direct comparison of the capabilities of each GPU. A few HPC-relevant benchmarks were selected to compare the T4 to the P100 and V100. Tesla P100 is based on the “Pascal” architecture, which provides standard CUDA cores. Tesla V100 features the “Volta” architecture, which introduced deep-learning specific TensorCores to complement CUDA cores. 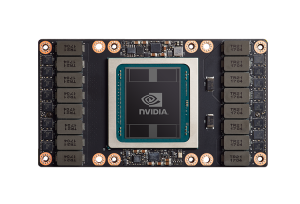 Tesla T4 has NVIDIA’s “Turing” architecture, which includes TensorCores and CUDA cores (weighted towards single-precision). This product was designed primarily with machine learning in mind, which results in higher single-precision performance and relatively low double-precision performance. Below, some of the commonly-used HPC benchmarks are compared side-by-side for the three GPUs. The single-precision results show Tesla T4 performing well for its size, though it falls short in double precision compared to the NVIDIA Tesla V100 and Tesla P100 GPUs. Applications that require double-precision accuracy are not suited to the Tesla T4. However, the single precision performance is impressive and bodes well for the performance of applications that are optimized for lower or mixed precision. The Max Flops for the T4 are good compared to V100 and competitive with P100. Tesla T4 provides more than half as many FLOPS as V100 and more than 80% of P100. The T4 shows impressive performance in the Molecular Dynamics benchmark (an n-body pairwise computation using the Lennard-Jones potential). It again offers more than half the performance of Tesla V100, while beating the Tesla P100. In the Fast Fourier Transform (FFT) and Matrix Multiplication benchmarks, the performance of Tesla T4 is on par for both price/performance and power/performance (one fourth the performance of V100 for one fourth the price and one fourth the wattage). This reflects how the T4 will perform in a large number of HPC applications. For S3D, the T4 falls behind by a few additional percent. Looking at these results, it’s important to remember the context. Tesla T4 consumes only ~25% the wattage of the larger Tesla GPUs and costs only ~25% as much. It is also a physically smaller GPU that can be installed in a wider variety of servers and compute nodes. In that context, the Tesla T4 holds its own as a powerful option for a reasonable price when compared to the larger NVIDIA Tesla GPUs. The T4 has substantial single/mixed precision machine learning focused performance, with a price tag significantly lower than larger Tesla GPUs. What the T4 lacks in double precision, it makes up for with impressive single-precision results. The single-precision performance available will strongly cater to the machine learning algorithms with potential to be applied to mixed precision. Future work will examine this aspect more closely, but Tesla T4 is expected to be of high interest for deep learning inference and to have specific use-cases for deep learning training. In the molecular dynamics benchmark, the T4 outperforms the Tesla P100 GPU. This is extremely impressive, and for those interested in single- or mixed-precision calculations involving similar algorithms, the T4 could provide an excellent solution. With some adapting algorithms, the T4 may be a strong contender for scientific applications that also want to utilize machine learning capabilities to analyze results or run a variety of different types of algorithms from both machine learning and scientific computing on an easily accessible GPU. In addition to the outright lower price tag, the T4 also operates at 70 Watts, in comparison to the 250+ Watts required for the Tesla P100 / V100 GPUs. Running on one quarter of the power means that it is both cheaper to purchase and cheaper to operate. If it appears the new Tesla T4 will accelerate your workload, but you’d like to benchmark, please sign up to Test Drive for yourself. We also invite you to contact one of our experts to discuss your needs further. Our goal is to understand your requirements, provide guidance on best options, and see the project through to successful system/cluster deployment. Device selection not specified: defaulting to device #0. This entry was posted in Benchmarking and tagged benchmark, gpu, tesla. Bookmark the permalink.